﻿Welcome to week 2 of Bloggers Biggest Loser hosted by Vicki and I! ﻿Although we started Bloggers Biggest Loser two weeks ago, I only got serious about it personally this past week. I know, way to be an example. But it's ok. You know why? I lost 5 pounds this week! The equivalent of a bag of sugar. Holla! I decided to join Weight Watchers for a month. I've done WW in the past, but have never been completely successful with it. This time last year I lost 15 pounds, and I plan to keep on going this time. I joined for one month only. I am determined to not waste money if it's not working. SO many times I paid for WW only to not use it and waste money. And so far so good. I tried a bunch of new recipes this week including Slow Cooker Lasagna, Egg and Bacon Breakfast Burritos (made twice they're so good), Texas Style Casserole, Banana Bread, and a Sausage, Peppers, and Potato dish. For week two, I'm providing a tip and a recipe! First up, a recipe. I apologize that I do not have a picture for this of my own. Preheat oven to 400ºF. Coat a small baking sheet with cooking spray. Coat a large nonstick skillet with cooking spray and heat over medium-low heat. In a large bowl, beat egg whites and eggs. Add bacon, oregano, salt, pepper and salsa; stir well. Pour egg mixture into prepared skillet; increase heat to medium. 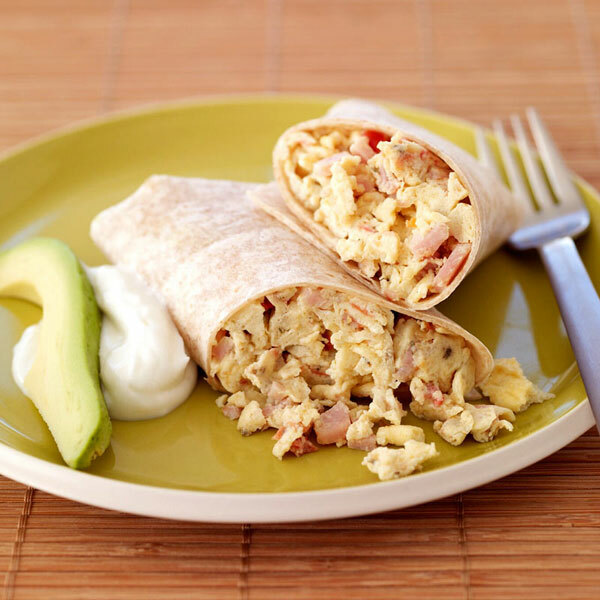 Let eggs partially set and then scramble using a spatula. When eggs are set but still slightly glossy, remove from heat. Spoon half of mixture into center of each tortilla. Roll tortilla to conceal filling, making sure to fold in ends. Place burritos, seam-side down, on prepared baking sheet. Bake until burritos are very hot, about 5 minutes. Remove from oven and serve each burrito with 1Tbsp sour cream. These are fabulous. Like I said I made these twice this week. I substituted a Tbsp of RF cheddar cheese on the burrito in place of the avocado and the points were the same. 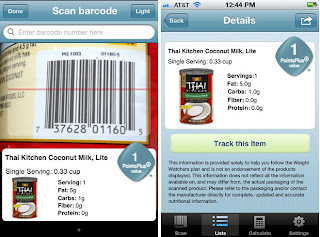 Weight Watchers Barcode Scanner App! If you're on Weight Watchers (paying customer) this app is SUCH a help. It's meant to be used at the grocery store to chek the PointsPlus values while you shop. Of course as soon as I downloaded it I started scanning everything in my cupboards. It's awesome and you need it.